This timely, comprehensive and interdisciplinary volume advances an original argument about the complex roots and multiple politics of globality. It shows that technological innovations and decisive developments since 1945 – from the nuclear revolution to anthropogenic climate change and debates about the Anthropocene – have prompted reflections on the global condition of humanity and helped reshape political communities by making the world (appear) small, manageable and interconnected. The contributors stress how human beings have transformed both their habitat and their view of human-earth relations since 1945. Such changes have been accompanied by important shifts in political visions, prompted new forms of human association, encouraged legal and institutional reform and spurred ideas about ecological humility. At the same time, the spatially all-encompassing nature of globality have also informed projects of human mastery and a range of practices historically associated with militarization and a strongly statist conception of national security. This volume reflects on these paradoxical relationships, their history and contemporary relevance. 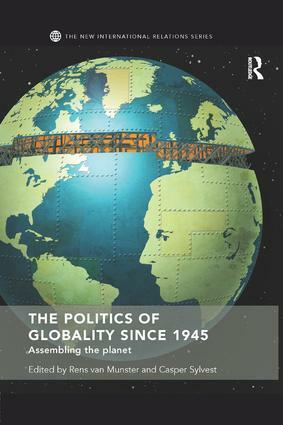 Contributing to the overlapping concerns of four burgeoning fields of study across the humanities and the social sciences - globality and globalization studies; geopolitics and political geography; Anthropocene studies; global governance and political theory – the book will be of great use to scholars and graduates working in these areas.